We’ve been fortunate at BlackOut to have a fruitful working relationship with MetroAction. We think it’s led to some of our best work and it’s helped MetroAction maintain its status as the leading provider of small business loans and resources in Northeastern Pennsylvania. 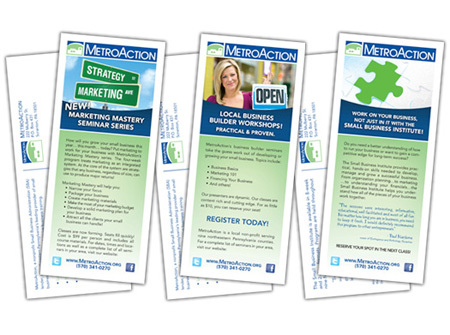 Recently, to help promote MetroAction’s upcoming business training seminars, BlackOut produced a series of print postcards that carry all of the pertinent information on the seminars and registration. The cards will provide a high impact, informative piece of collateral that MetroAction staff can distribute to their network of clients and referral partners.